The bow of the boat cut into the oncoming waves, smashing hard against them in the late August sunlight. Aboard my fathers boat, I made the two hour boat trip to the ghost town of Port Douglas at the northern tip of Harrison Lake. Located roughly two hours out of Vancouver, Harrison Lake is the largest lake in the southern Coastal Mountain region of B.C.. It is a beautiful destination used in the spring, summer and fall months by fishermen, campers and boaters alike. I have done all these activities on the lake, but this wasn’t your standard trip to Harrison. It was more of a journey. My father, brother and I were boating to the northern end of the lake, to a small canal dug by Chinese immigrants in centuries past to service a small lake called Little Harrison lake. At the head of Little Harrison Lake were the remains of a town that has been long abandoned: Port Douglas. I developed an interest in British Columbian history at a younger age, especially in regards to ghost towns and abandoned mines. 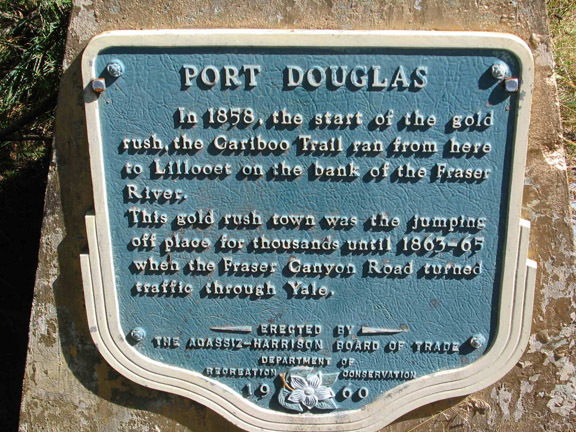 I have been told Port Douglas served as the first capital of the colony that would eventually become British Columbia, although I cannot find a date to back up this claim. It was the second sizeable settlement on mainland B.C. after Yale and it served as major steamboat port for the Cariboo gold mining operations in the north. Excited and full of anticipation to see of the old town site, and gaze upon a piece of British Columbia of old. Although unsure how much was left of Port Douglas, I knew that once we had made it to the town, I would become immersed in the moment, and the rest wouldn’t really matter. The boat pushed forward and the small canal was coming into sight. It was narrow and shallow in areas, not used regularly in close to a hundred years. My brother and I watched from the stern of the boat as we delve over logs and other debris, my father steering and monitoring the depth sounders small colourless screen. We weaved the boat the length of the canal and made our entrance to Little Harrison Lake. The lake was small, especially when compared to the larger Harrison lake, one of the largest lakes in British Columbia. I gazed to the head of the lake where an eold, fallen down wharf was clearly visible. This is where we would spend the night. We docked at the old wooden relic and crawled our way onto dry land via an old wooden beam laying across the water from the shore to the wharf. At first glance, it appeared not much remained of Port Douglas, but with a little exploration I abandoned this assessment. The most recent buildings abandoned at Port Douglas were left from logging operations that were operated on the old town site up until roughly 1970. 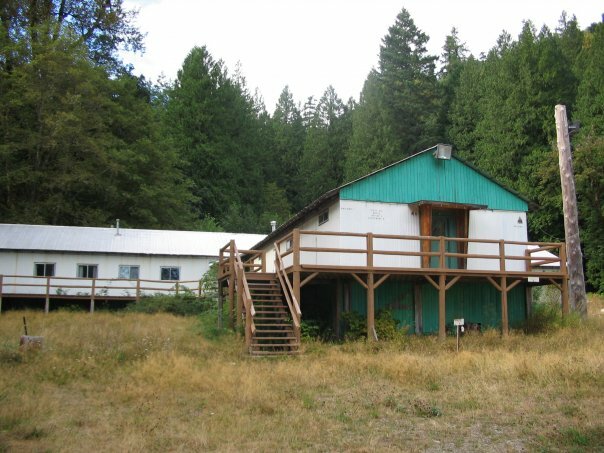 The logging company still employed a care taker to maintain and watch over the company interests in the town, which was about a half dozen buildings, a truck and some old logging equipment. The caretaker was an older women, roughly 60 years-old, who had a vast wealth of knowledge of the old town site and its hidden remains. The woman showed us the remnants of the court house, sadly all that was left was a knee high stone wall. Next to the stone ruins was a large and ancient looking tree that was the site of the first legal hanging in the colony, the branch that the victim was hung from is on permanent display in the Royal Museum of British Columbia in Victoria. I believe the victim was found innocent after the hanging. Through our exploration of the town we also uncovered two old buildings, barely standing. They were made of wood and contained a collection of forgotten artifacts; old leather shoes and boots, tobacco cans, petrol supplies and an array of other relics from the past. Also near the buildings we located a rusted and weathered band saw, a lingering remnant of the logging days that are long since gone. Other mentionable finds are the old cemetery, roughly a 10 minute walk out of town on the old road heading towards Lillooet. It is located on the left side of the road up a slight hill, it’s overgrown and easy to miss if you aren’t paying attention. If you continue to walk up the road another five minutes there is a large ravine on the right side of the road. This canyon is filled to the brim with old abandoned cars, tractors and other equipment that had been pushed off the edge for disposal. Some of the vehicles had to be at least 50 years old. Maybe older. We wandered back down the dusty old road to the boat at twilight, lost in thought. It was hard to imagine that a little over a century ago this area would have been crawling with rowdy miners and prospectors, saloons lining the streets and steam wheelers coming into port daily. Now the only visitors Port Douglas sees are those adventurous enough to travel the length of Harrison Lake to explore its remains. A proud city, now a vanishing piece of our history, wasting away in the mountains above Harrison Lake.